Judy Perilstein has a passion for antique buttons. She is inspired by the diversity of material, texture and styles reminiscent of many fashion eras. Her designs strive to honor the button maker and the saver by creating pieces that showcase each wonderful button. 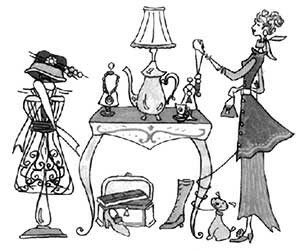 Judy hopes to connect the modern-day woman with these treasures of the past to enjoy way into the future. She would like to thank Linda Martin for introducing her to the very idea of button jewelry making years ago.